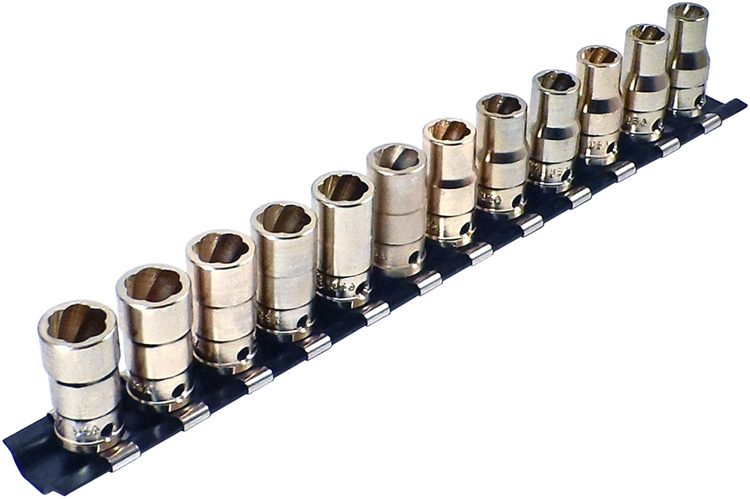 Savi-Sockets® from Omega Technologies are manufactured in the USA of high-strength tool steel, the socket is then heat-treated for optimum durability, and finished with a highly visible corrosion-resistant coating. It is suited for use on aluminum, steel, titanium, and all coated collars. As an anti-FOD measure, it incorporates a set screw for positive retention. The OMEGA SAVI-568-HL Savi-Socket 12 Piece Set For Hi-Lok And Hi-Lite is one of thousands of quality tooling products available from MRO Tools. Please browse Savi-Socket Hi-Lok Removers for tools similar to the OMEGA SAVI-568-HL Savi-Socket 12 Piece Set For Hi-Lok And Hi-Lite. OMEGA SAVI-568-HL Savi-Socket 12 Piece Set For Hi-Lok And Hi-Lite description summary: OMEGA comprehensive set of 12 Savi-Sockets®, providing sizes for the majority of Hi-Lok®and Hi-Lite® collars. Removes all -5, -6, and -8 Hi-Lok®and Hi-Lite® collars (Sizes 5/32'', 3/16'', and 1/4'' diameter collars) Quantity discounts may be available for the OMEGA SAVI-568-HL Savi-Socket 12 Piece Set For Hi-Lok And Hi-Lite. Please contact MRO Tools for details.